Homepage. This page: A smart Member's Book as given out to anyone who joined the BDC. "The club was founded in June, 1934, by Vauxhall Motors Ltd., the manufacturers of Bedford Trucks (interesting that they called them trucks, not lorries!). It exists to help drivers of Bedford vehicles, and to foster good fellowship amongst them. Membership of the Club is open to Bedford drivers and owner-drivers, relief and part-time drivers and drivers' mates in Great Britain and Northern Ireland, and is free. 'Application for Membership' cards are sent on request. The benefits extend in several directions. The Free Insurance of members is one of the most appreciated benefits. Under the policy, in the event of death from accident when on the road with a Bedford, the sum of £100 is paid to the beneficiary named by the member, and additional amounts of £20 are paid in respect of each child under the age of 16. So that members can recognise each other a lapel badge and a bumper bar badge are provided free. There is a small charge for replacement badges. Also suitable transport cafes are appointed, after approval, as official Rest Houses, so that wherever the B.D.C. sign is displayed, members will be assured of somewhere to park, good food, cleanliness and a welcome. Up-to-date lists of appointments are sent members from time to time. All that is asked in return is that members observe the rules of the road, be considerate to other road users, and when possible, without prejudicing their employer's interests, help fellow members who may be in trouble on the road. The Organiser of the Club will, of course, be very glad to receive any comments, suggestions or criticisms members care to send along. Details of roadside help given by a fellow member, for instance, will be welcomed. So, too, will reports on the services offered by appointed Rest Houses, or particulars of suitable transport cafes not already included on the B.D.C. list." 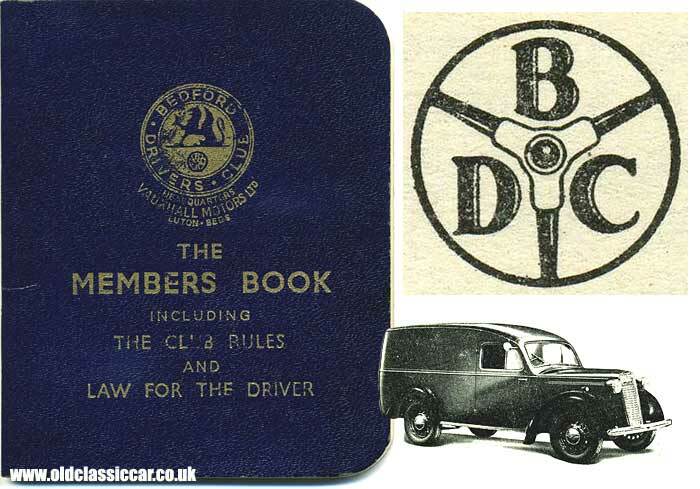 Shown below is the cover of the Bedford Drivers Club handbook, a scan of the BDC logo, and a picture of a Bedford light commercial, typical of the era (a 10/12cwt Bedford JC van). Driving Licences A, B and C.
The handbook goes on to list the membership rules in more detail, and a layman's view of motoring law as applicable to the haulage industry in 1949. The three types of Goods Vehicle licence are also explained, namely "A" "B" and "C". Licence A applied to vehicles only used for hire or reward. Licence B applied to commercial vehicles in part used for hire and reward, and which were also used for carrying goods as part of the van or lorry owner's business. The C licence was solely to be used on vehicles used directly with the owner's business, and adds: "there are no restrictions at all upon where it goes or what it carries, apart, of course, from the limits imposed by the fuel rationing system ... In no circumstances, however, may it [the vehicle] be used 'for hire or reward'. So that if somebody asks you to carry some goods for them, even though no payment has been offered, you must not consent. If, for instance, your employer is a greengrocer, and operates your vehicle under a "C" Licence, you may only carry goods which he is buying or selling. You may not even oblige a customer by moving an armchair, say, from one house to another". Handy information on speed limits, record-keeping, overloading, driver fitness, maintaining a lorry or van in serviceable condition, dealing with road crossings and accidents, and driving tests is also included. except in the case of a contract carriage, beg, sell or offer any article for sale. I'd be interested to know if any other commercial vehicle manufacturers operated a similar drivers' club like this? it suggests that camaraderie was alive and strong amongst wagon drivers in the 1940s and 1950s, many roughing it in worn-out vehicles (often ex-military) and driving for long hours without a break, faced with the daunting task of hand-loading or unloading a cargo at their journey's end. A number of other pages on oldclassiccar.co.uk feature older Bedford vans and lorries. For instance, a story describing the restoration of a 1933 Bedford WHG lorry is featured here, and some great period images feature in the old photos section, including this page which presents two signwritten Bedford CA vans in the 1950s, again typical of the type of vehicle that a BDC member could have driven. A free PC (Windows XP) screensaver, incorporating photographs of a number of classic Bedfords, can also be found on the site, over on this page. Anyone restoring one of these fine British lorries may well find the classic lorry free ads section of use too. A photo of a 1937 Bedford breakdown lorry, which apparently was operated by Bedford Drivers' Club member No.1 can be seen on this page.